20/12/11 - Acquisition - Châlons-en-Champagne, Musée des Beaux-Arts et d’Archéologie - The museum at Châlons-en-Champagne preempted a 12th century limestone capital during the Piasa auction held on 2 December (ill. 1). Presented with an estimation between 8,000 and 12,000 €, it was sold for 20,365 €. The acanthus leaves sculpted on all four sides and two levels reflect an interpretation of the Corinthean theme similar to that of a capital residing in fact at the Châlons museum (ill. 2). The motifs on this second architectural element are slightly different : the first level shows fewer acanthus leaves and the corner leaves on the upper level do not curl up but instead reach straight out to touch the opposite leaf. In both cases however, the stylized forms, the symmetry and the very graphic treatment reveal a more naturalist artistic search. 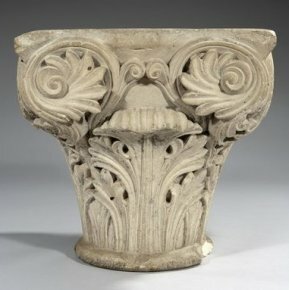 These two capitals, also with comparable proportions and size, might be from the cloister at Notre-Dame-en-Vaux built in the second third of the 12th century and destroyed in 1759. Archeological digs were carried out between 1963 and 1976 and the fragments found there were placed in the museum, created for the occasion, which then became famous for its renowned column statues and other documented capitals. Besides the fact that the Corinthean décor can be found in the church and cloister at Notre-Dame-en-Vaux (the portal, the nave, the side aisles and the triforium), two other arguments support this theory : the limestone of the capital which came up for auction was analyzed and is not incompatible with the one from near Epernay composing the sculptures from the cloister at Notre-Dame-en-Vaux ; also, traces of gray paint are still visible on both capitals and, significantly, similar marks can be seen on other elements from the cloister. 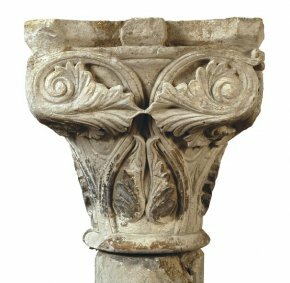 Whatever its origins, this capital shows a very fine degree of execution, also present, as pointed out in the auction catalogue, on some of the capitals in the cloister at Saint Denis, Paris.